Mother’s Day Hampers every mum dreams of. Every year, our sell-out hampers are delivered directly to the door of beautiful mums like yours, right across Australia. 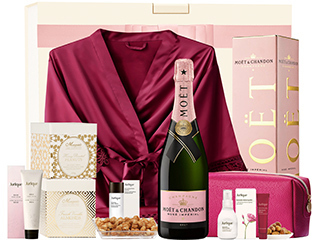 We’ve filled our Mother's Day hampers with love and luxury to help you express thanks on Mother’s Day. From pamper hampers to personalised women’s gift hampers; will your mum be one of our lucky Mother's Day gift recipients this year? 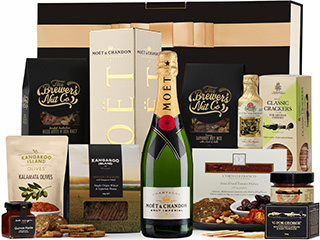 Mother’s Day Hampers Every Australian Mum Will Love With FREE Delivery! She’s given you the gift of unconditional love. We believe your mum deserves only the best, and we know you want to bring a smile to her face with a Mother’s Day hamper to show her just how loved she is. Don’t trust her happiness to just anyone! 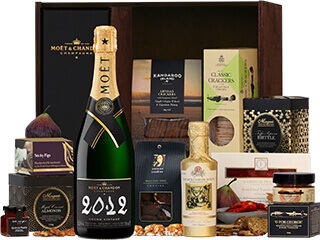 As Australia’s premium gift hamper provider, we’re so proud to help you express your love and thanks with beautifully curated gift hampers backed by decades of expertise. Our exclusive Mother’s Day gift hampers are delivered free to Mum’s door from The Hamper Emporium. 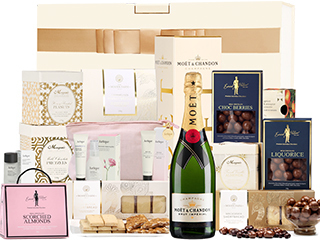 The Hamper Emporium hampers for mums include everything from luxury skincare, world-renowned cosmetics, jewellery, fashion accessories, award-winning wine and Champagne and of course our range of exclusive Personalised Mother’s Day gifts. 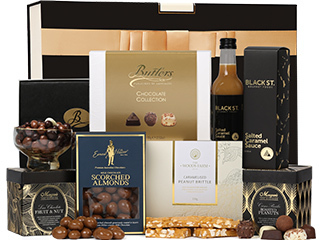 With decades of experience, we’ve sourced the finest products from premium, world-class brands to create Australia’s most impressive Mother's Day gift baskets suitable for all budgets, occasions and recipients. A range that’s beautifully curated to ensure every mum feels like she’s the world’s most special mum. 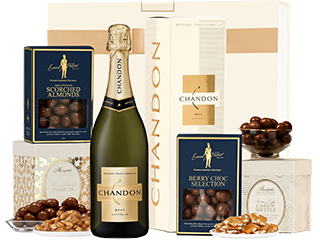 Choose one of our hampers for Mother's Day filled with creamy chocolates, candied nuts, shortbread that melts in the mouth, and other sweet treats, as well as tempting salty savouries and exquisite Champagne and wines from world-class wineries. Pamper packs stacked with skincare and fragrance ranges, even luxury bathrobes, are certain to make a loving impression. For Mother’s Day gifts online, designed to arrive on time, every time, trust The Hamper Emporium to look after your mother on her special day. 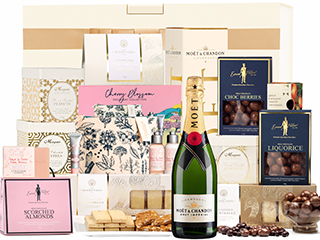 For Mother’s Day hampers that are as unique as your mum, as beautiful as her love, and as stunning as any gift she could ever wish to receive, The Hamper Emporium has an endless selection of Mother's Day gifts to help celebrate your mum’s special day this year. Stand out with a personalised gift basket for your mum in 2019 with our custom Mother's Day gift basket range. Looking for a personalised Mother’s Day hamper? Our customised women’s accessories offer a unique gift idea that’s truly all about celebrating her. For a unique present for mum, that’s guaranteed to make an impression, imagine Mum’s smile when she receives a personalised gift featuring her own initials beautifully embossed in gold. Our Personalised L’Occitane Hamper is just one of our exclusive personalised Mother's Day gift hampers that contain custom leather gifts for her. The L’Occitane luxury gift pack is beautifully presented in our luxury cream gift box with an elegant gold ribbon to ensure that the moment your precious mother opens her parcel, she’ll know just how loved she is. The L’Occitane Luxury Hamper features a range of luxurious skincare from one of the world’s favourite skincare brands. Beautifully crafted in France, L’Occitane delivers spa-quality skincare to pamper your mum and is one of our favourite pamper gifts for women. Our personalised women’s fashion range includes a beautiful selection of monogrammed leather accessories. Women love our Leather Photo Keyring With Custom Monogram. With a gold clasp and a clear, protective pocket to display a photo, nothing is more special to mums than being able to keep her loved ones close. Beautifully monogrammed in gold this stylish fashion accessory will be delivered with her initials embossed. What Are This Year’s Most Popular Mother’s Day Gifts? Let’s start with the hamper that contains all of mum’s favourite things, it’s a pamper hamper for mum that’s all about spoiling her and making her feel amazing. The ever-popular Jurlique Pure Indulgence Hamper from The Hamper Emporium is hard to overlook for the perfect gift this Mother’s Day. Inside, she’ll find a bottle of Moet Champagne to toast her beautiful family, artisan-made gourmet nibbles, including chocolate-coated berries, scorched almonds, pretzels, shortbread, and more, and an extensive range of botanically brilliant Jurlique skincare. Your mum’s heart will be infinitely warmed as she glows with appreciation for this premium Mother’s Day gift box from The Hamper Emporium. Another popular gift idea is the specially curated Rifle Paper Co Mother’s Day Gift Hamper. The experts in beautiful stationery products, Rifle Paper Co has teamed with French company L’Occitane, to produce this dynamic duo of a gift pack. Contained within is a range of fabric-lined notebooks, French-made hand cream trio adorned with original, floral-designed illustrations are also Australian-made sweet treats. This surprisingly affordable and memorable Mother’s Day gift hamper includes free delivery throughout Australia. What’s not to love about that? 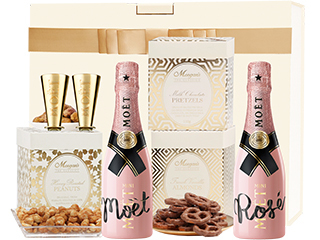 The Moet Vintage Gift Hamper is packaged in pure class and designed for mums with style. Grand Vintage Champagne is just the start. There’s also artisan olive oil, gourmet tapenade, nuts, crackers and other delectable nibbles to delight the most discerning epicurean. But these complete packages for making mum’s day barely scratch the surface. The huge range of gift hampers from The Hamper Emporium ensures there’s an option for every mum. Whichever one you choose, and whatever luxury items are to be found inside, the beautifully presented hampers and packaged gift sets from The Hamper Emporium are designed to impress with the VIP treatment, arriving in luxury packaging and our keepsake luxury gift box with ribbon detail. Are Mother's Day Gift Baskets A Good Choice For 2019? Mums everywhere will love the endless range of gourmet edibles and drinks hampers, pamper products, celebration gift hampers, and so much more, from The Hamper Emporium. If your mum fancies herself a foodie, and what mother doesn’t, why not give the unequalled quality of premium local produce from some of Australia’s most exquisite artisan producers in our deluxe and ever-popular Foodies Hamper. 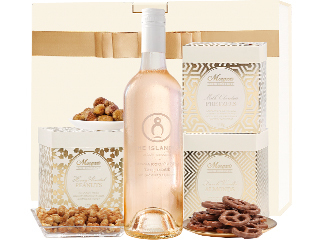 This delicious gift assortment shines with the food of love, handmade with artisan care. The bountiful produce within, which has been discerningly selected, features a range of local produce that is second to none. Inside, she’ll find freshly made roasted eggplant and chargrilled capsicum tapenades full of rich flavour, perfect for any tasting platter. Choosing the perfect Mother's Day gift can be difficult even if you know your mum really well. We've used over a decade of experience to curate the most beautiful of products into luxury hampers that come presented in the most stunning of ways, to ensure that the moment the gift box arrives at your mum's door, she'll be blown away by the beauty and the quality of her gift. Don't settle on just one single gift for mum this year, instead gift her a hamper filled with a massive selection of products for her to taste, try and be pampered by. She deserves more than just some flowers, she deserves gourmet luxury that shows her just how loved she is. Where To Buy Australia's Most Beautiful Mother's Day Hampers Online? A beautiful mum is a priceless gift to treasure for a lifetime. She provides unconditional love, support and care, and is always there. What if you could give your mum an online gift hamper that expresses your endless gratitude and appreciation? At The Hamper Emporium, gift giving is our expert speciality. There is a wide range of perfectly packaged premium products in our Mother’s Day gift hampers for you to purchase online. It’s as easy as can be to browse our online hamper store and organise delivery right to mum’s door. 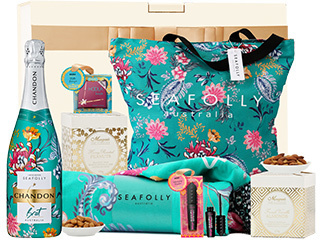 The added bonus of free delivery, Australia wide, makes the choice of a stunning gift hamper for mum simply irresistible. The Hamper Emporium has years of experience in crafting and curating expertly prepared hampers, filled with luxury items for Mother’s Day, birthdays, anniversaries and all special occasions. There is also the option of securing a Free Mother’s Day Premium Gift Card and also complimentary service delivery throughout Australia. It’s never been more tempting or convenient to provide mum with a gift hamper that matches her level of love and brilliance, with a little help from The Hamper Emporium. If time is of the essence and you seek for your gift to be delivered on the same day, express delivery can also be arranged at the time of checkout. 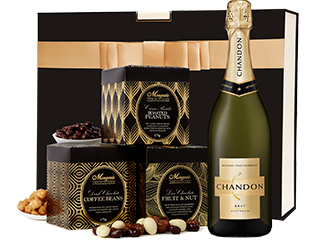 When you shop online, you’re sure to find the most appropriate, suitable, discerning and ever-beautiful Mother’s Day gift hampers to delight mums of all tastes and ages.